KNORR lemon sauce is perfect to use as a base. This sauce in this Asian inspired recipe is enhanced using additional fresh ingredients. Preheat the oil into a large grill pan and season the salmon with the salt and pepper. Place on the hot grill pan and cook each side of the salmon until golden brown. Finish cooking in a preheated oven (180 degree Celsius) until med rare. Wash and clean the Chinese broccoli and place into boiling water. Cook until tender. Remove and chop into portions. Finely shred the peeled ginger and place into a bowl. Add the rest of the ingredients. Mix well to create a dressing. 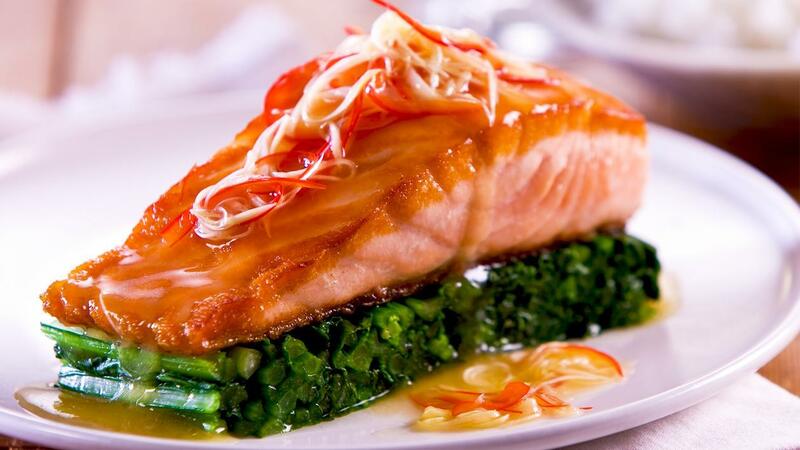 To serve, place the chopped Chinese broccoli onto a plate with the cooked salmon, drizzle KNORR Chinese Lemon Sauce GF over as the dressing.